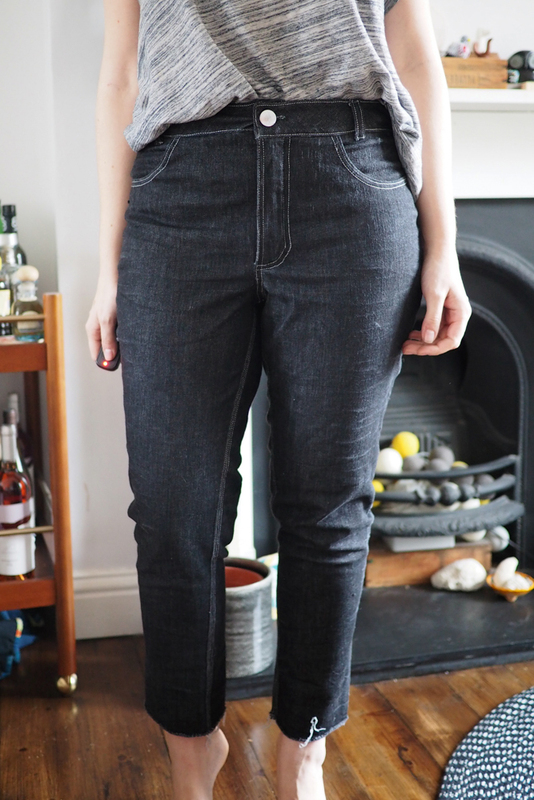 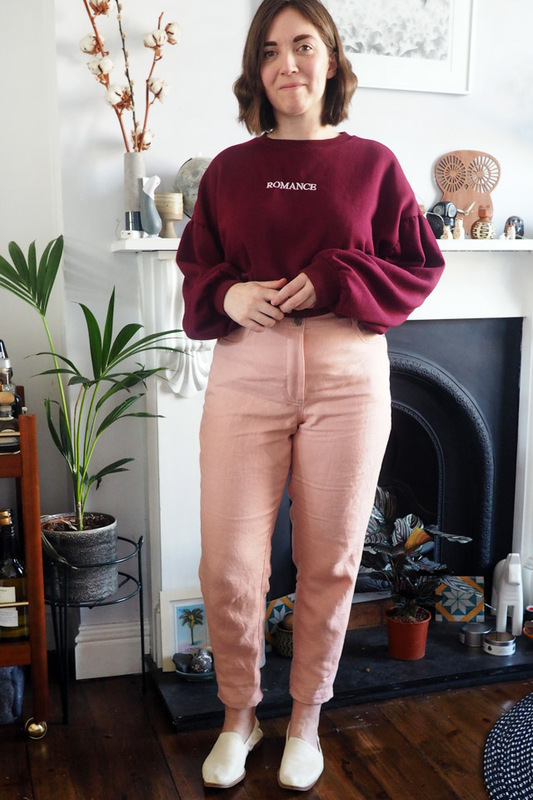 Here’s the second pair of jeans made from my self-drafted pattern! 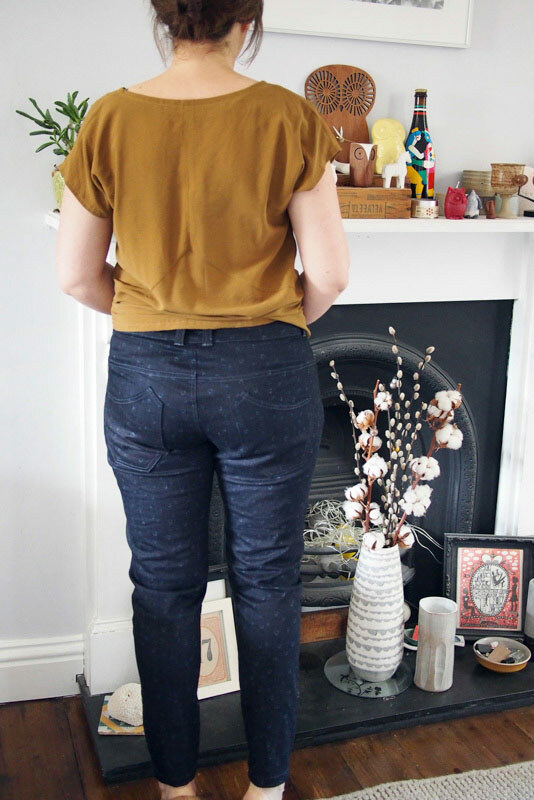 In a classic blue denim this time, an indigo selvedge number from my go-to denim source, Ditto Fabrics. 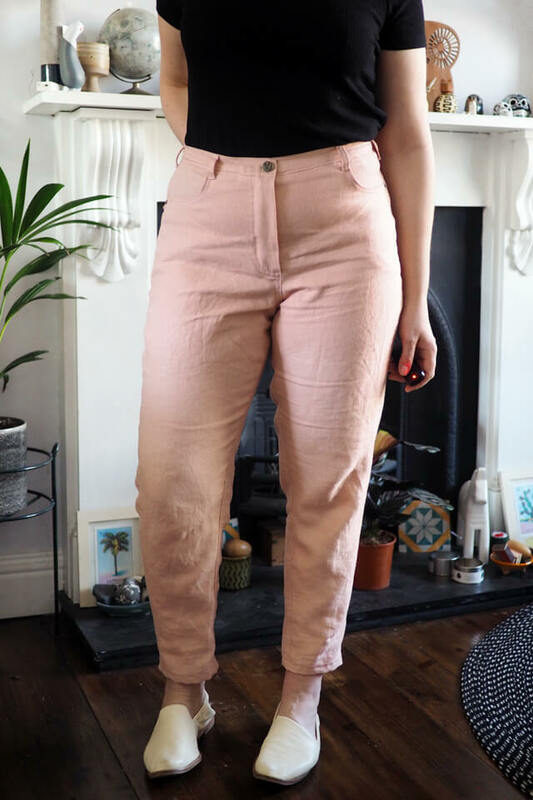 I made a few little tweaks from my pink pair, mainly to get the centre back fitting better. 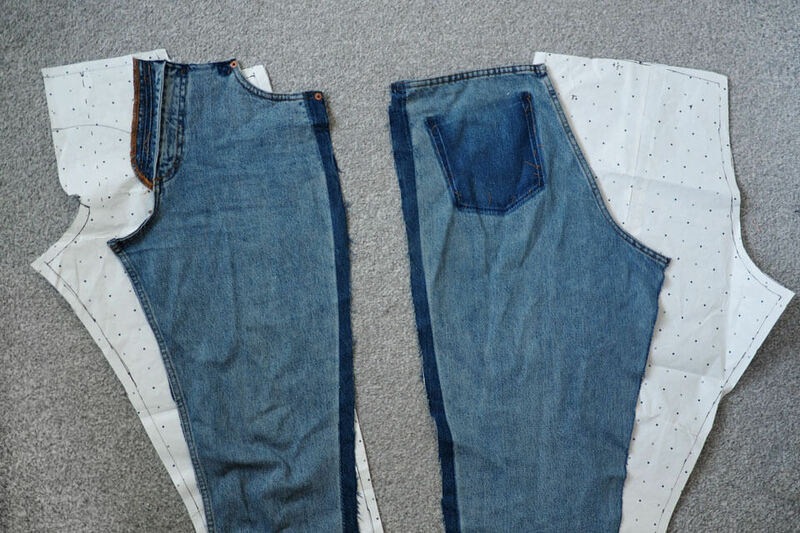 I angled the back yoke seam even more to account for excess fabric in the small of my back, and also transferred a sliver at the top of the back leg onto the bottom of the yoke, as the yoke was looking a bit shallow. 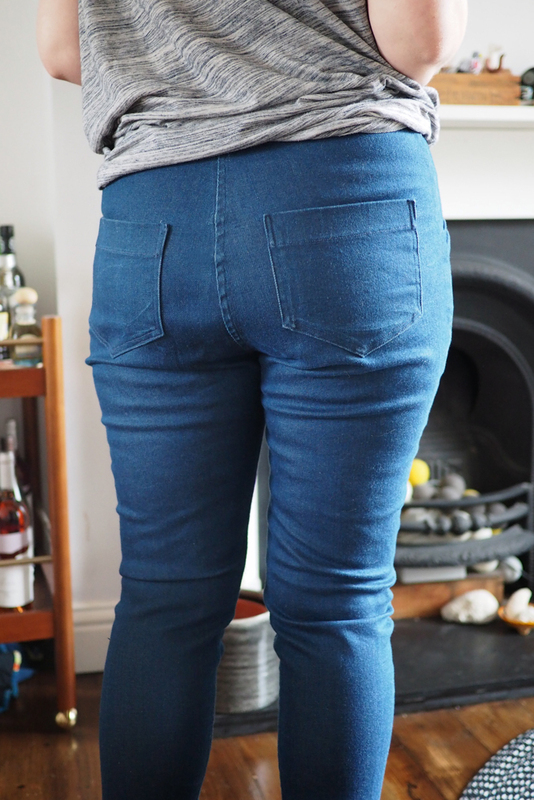 I’ve still got a fold there, so next time I’ll take even more out. 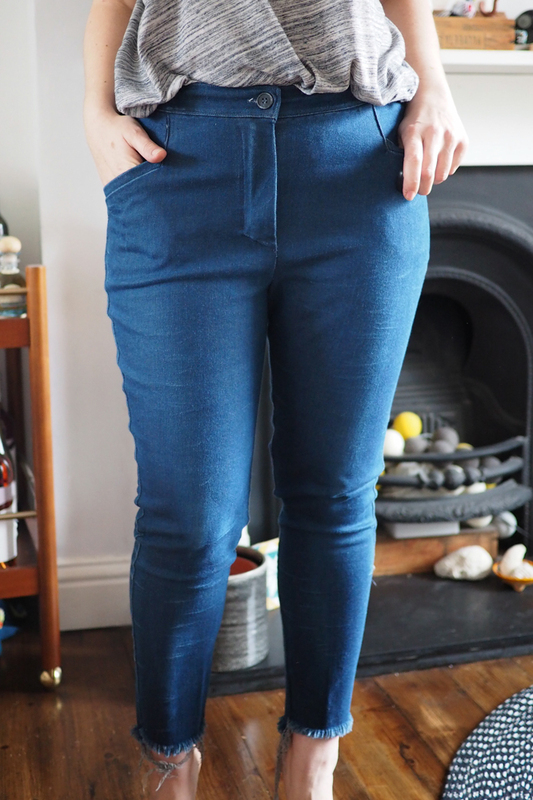 In further recycling efforts from my Monki base pair, this time I reused the zip! 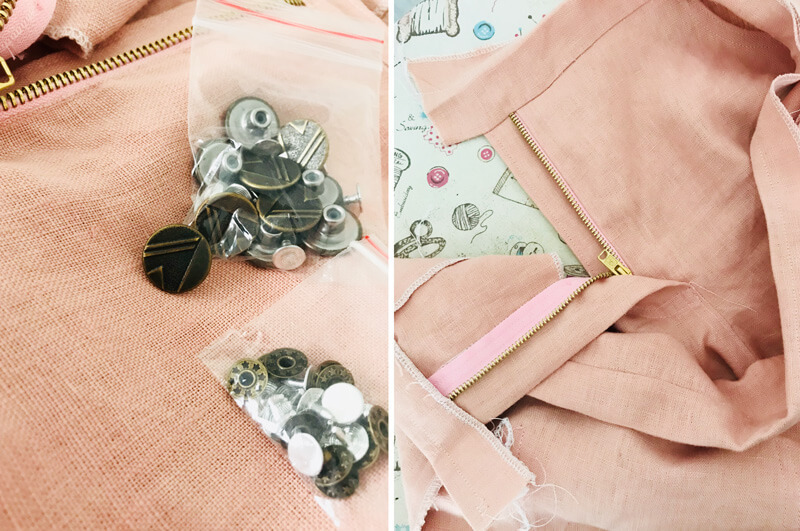 I used some scraps of rather loosely-woven ikat cotton for the pocket bags. 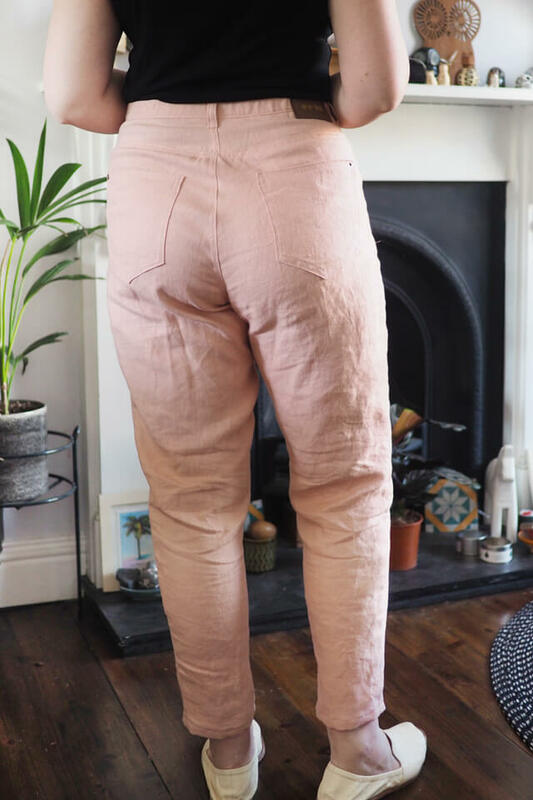 I should have used something more stable, I hope they don’t shred quickly. 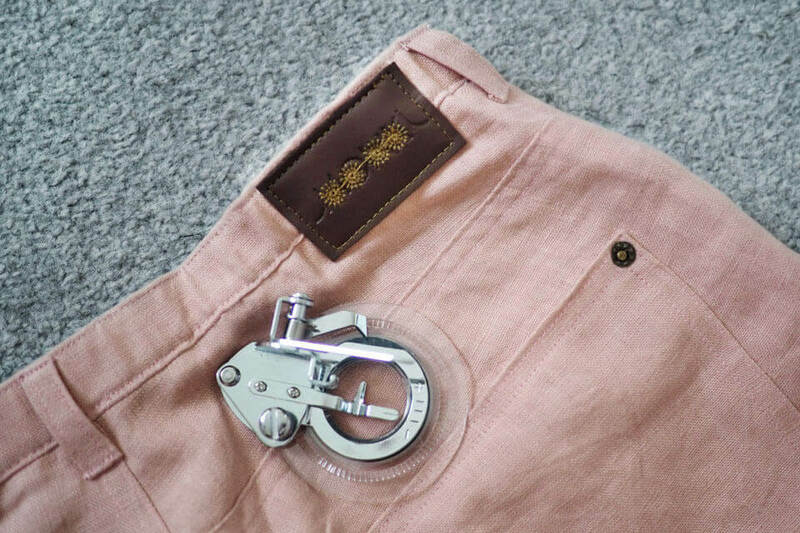 To keep things interesting I tried a different technique for the waistband, where the inner waistband is sewn to the inside of the pants first. 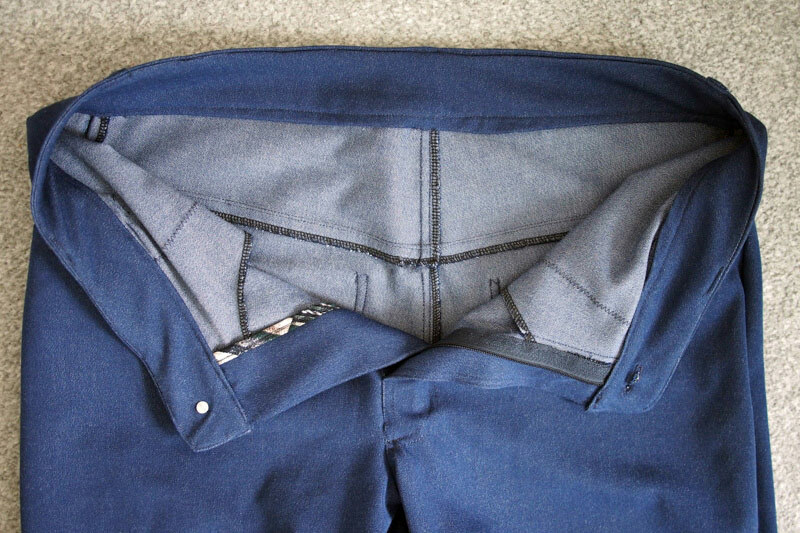 Then you flip over the outer waistband, tuck in the seam allowance then topstitch and seal the outside in one pass. 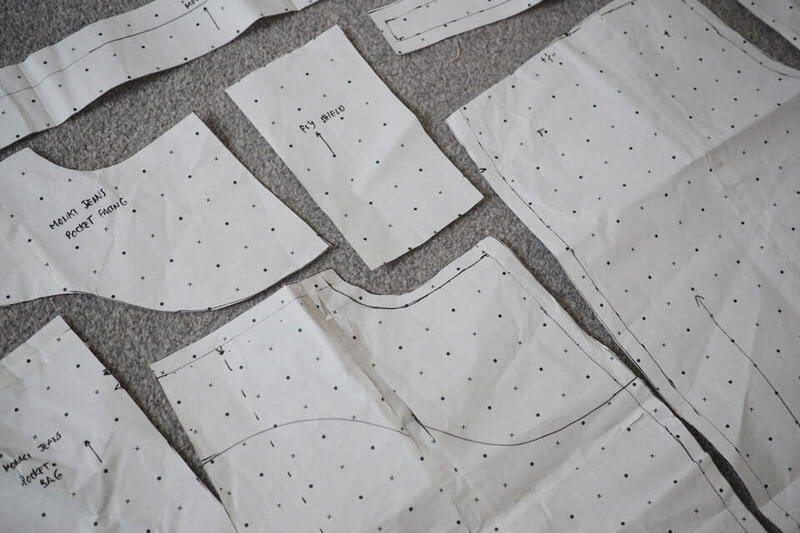 It’s a little bit like the tutorial that Heather recently posted on her blog. 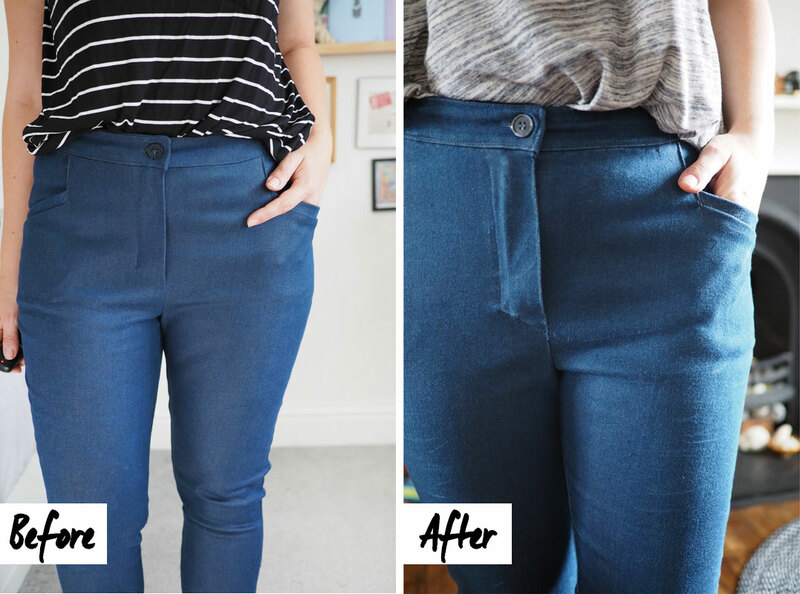 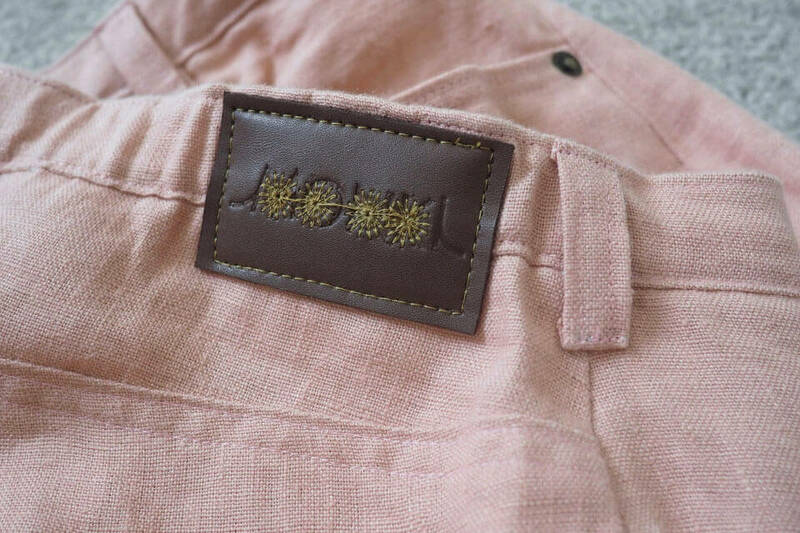 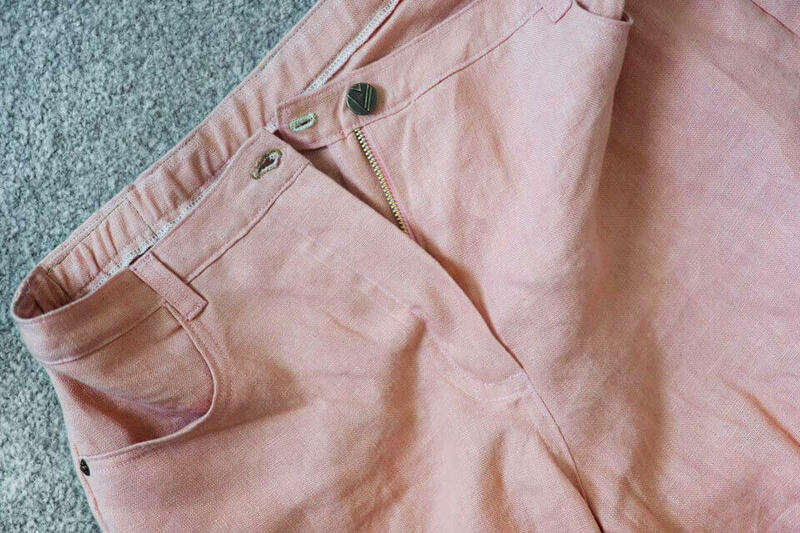 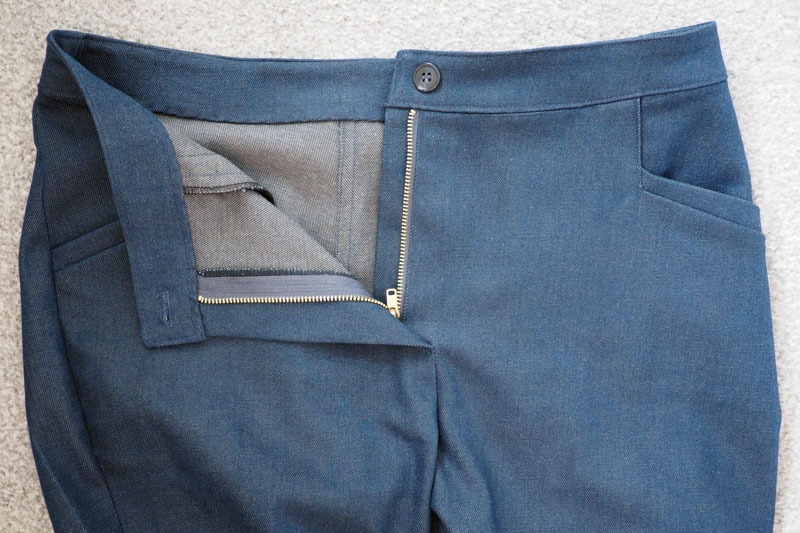 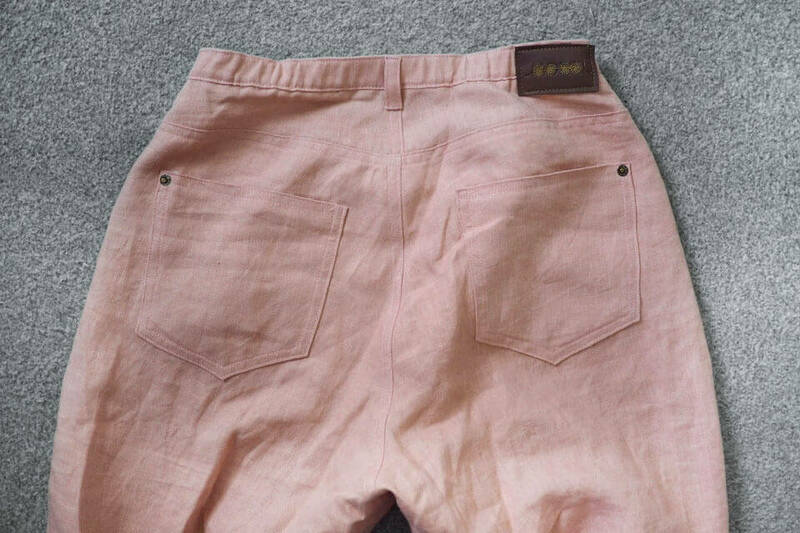 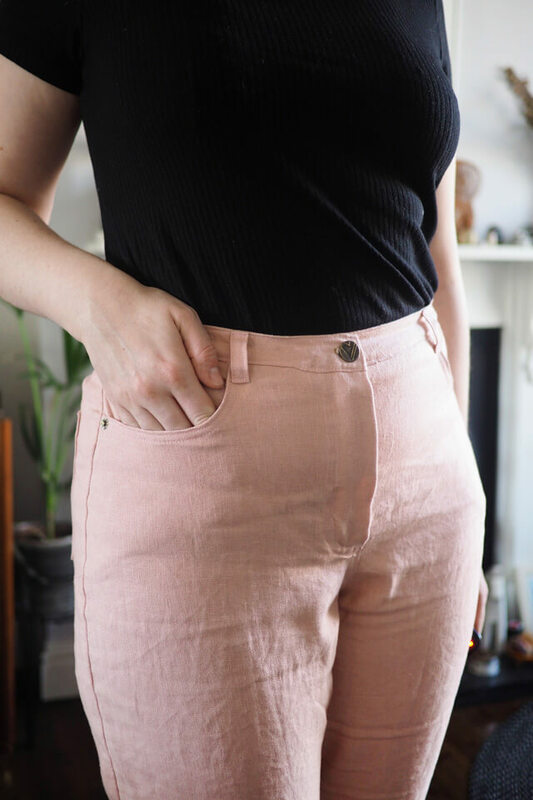 The benefit is there’s no need to invisibly secure the inner waistband like the regular technique, since you sew that first and then secure the outer waistband from the outside. 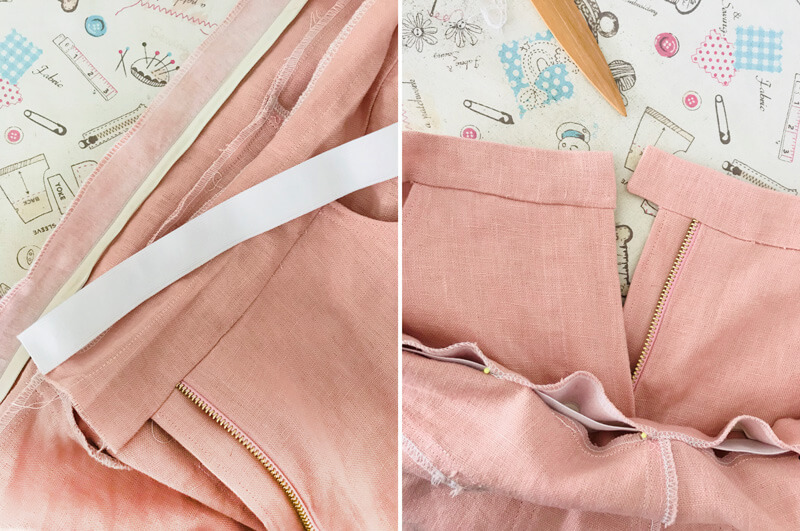 However I found that while the inside does indeed look super neat and tidy, it was harder to achieve a good looking result on the outside, particularly at the centre fronts where it felt bulkier than usual and was difficult to keep all the fraying edges tucked away, even with a liberal use of Aqua Glue. 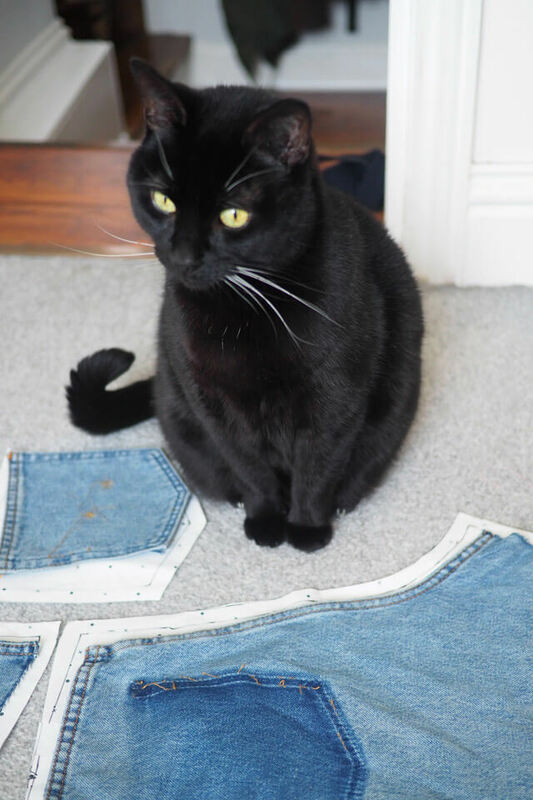 I had to re-sew a few bits where my stitching went awry, and was glad I wasn’t using contrasting topstitch thread! 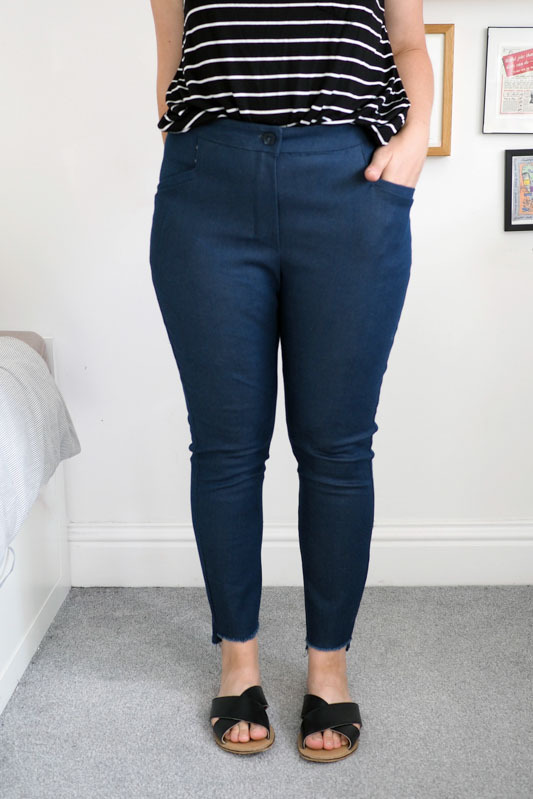 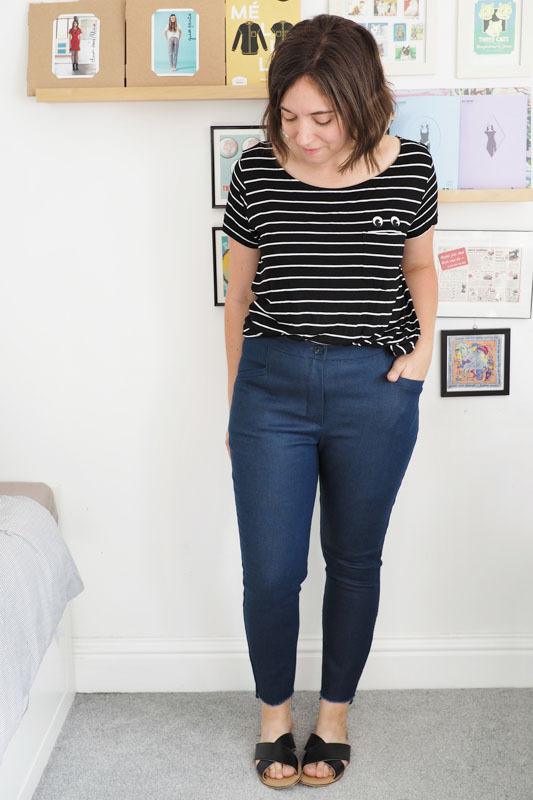 My daily wardrobe has been desperate for jeans like these, since all my RTW pairs of this style are currently a little too tight (cold weather comfort eating and no exercise, I see you) and I don’t own a plain indigo pair. 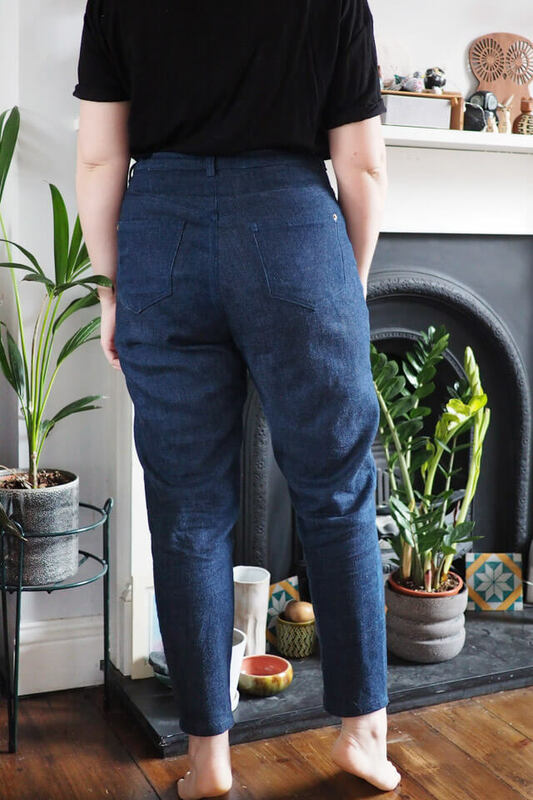 This pair has the benefit of being way more comfortable than my Monki RTW ones even when they did fit, since the denim is super soft and quite lightweight (and I think it has some elastane in, unusually for a selvedge), and the fit being obviously more tailored to me. 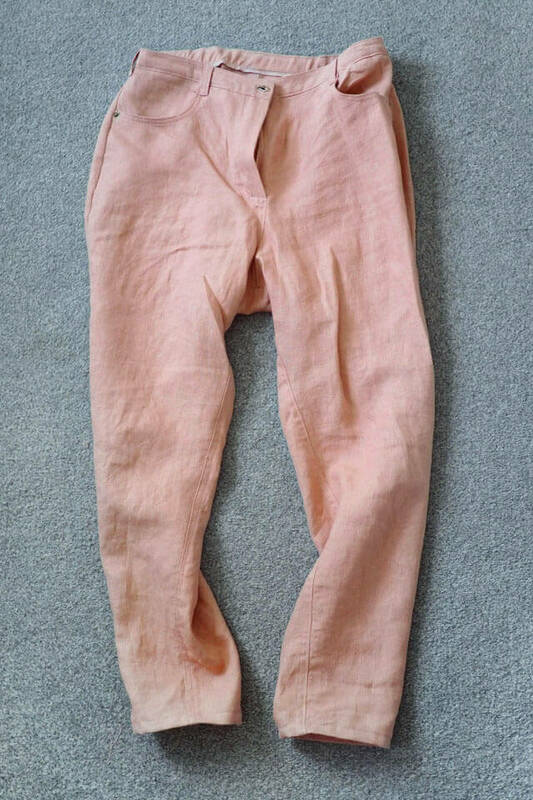 They’ve had plenty of wear already! 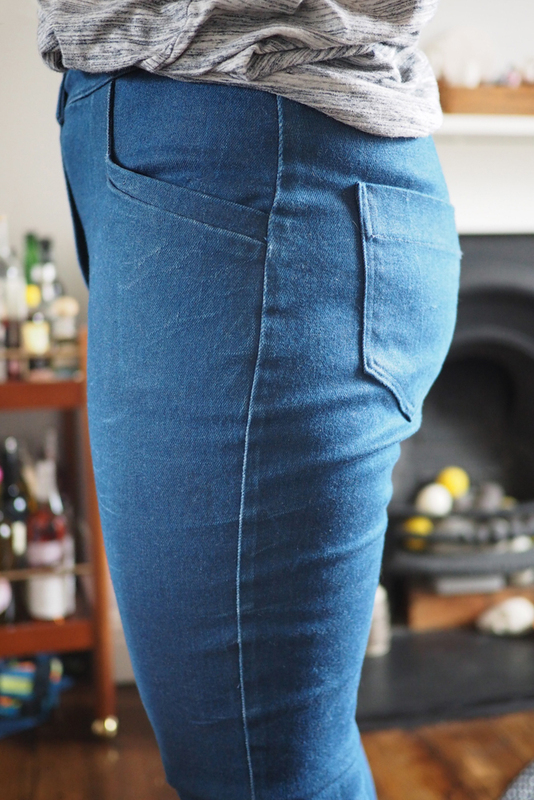 I just wish I’d done slightly contrasting topstitching for a bit of visual interest. 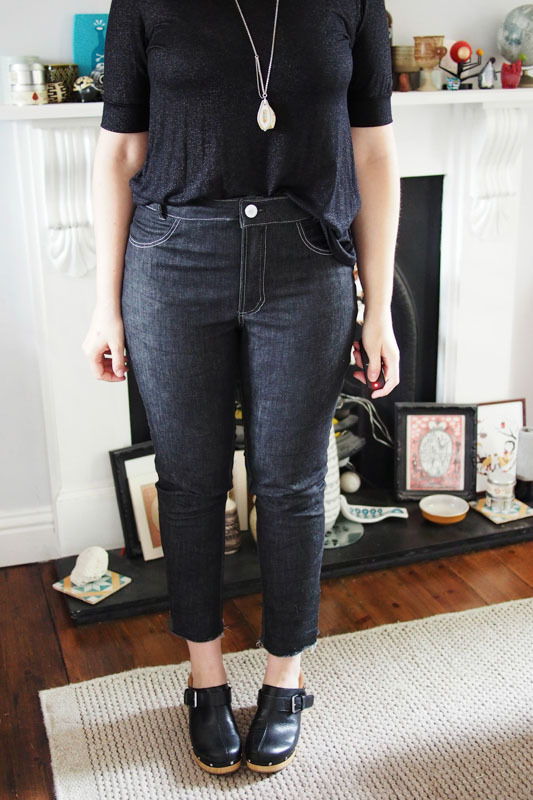 I’m now on the hunt for a true solid black to continue building up my jeans rota. 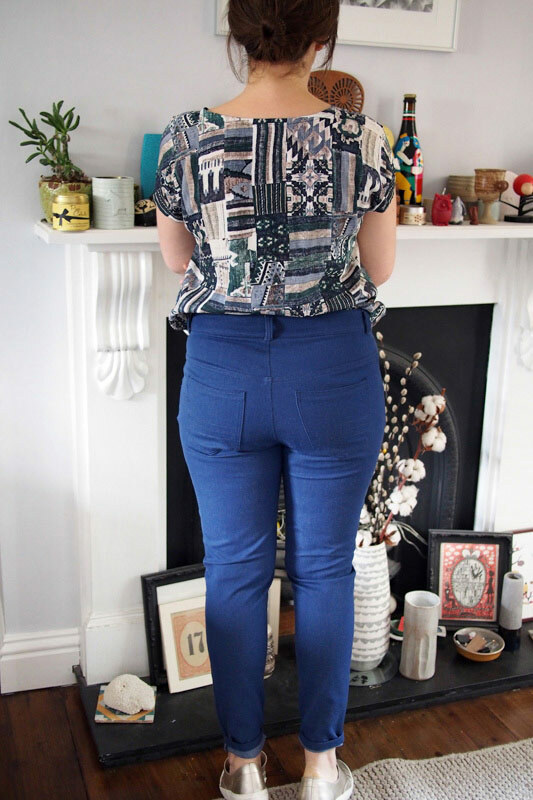 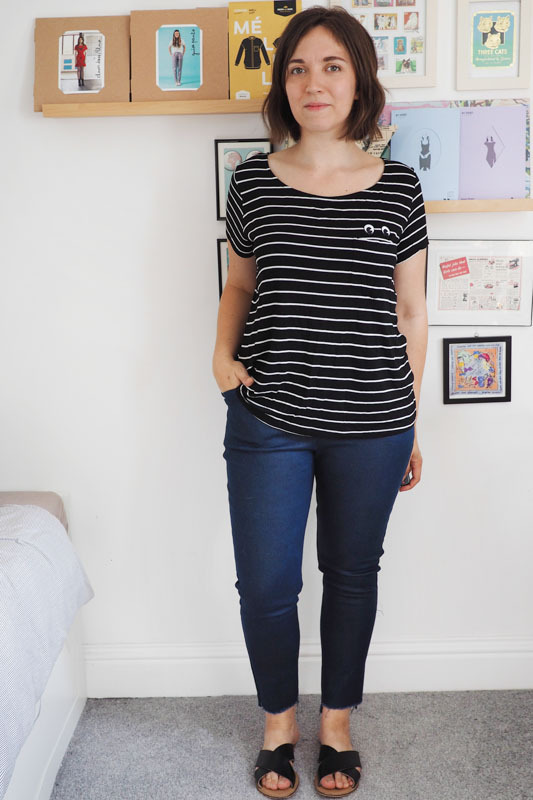 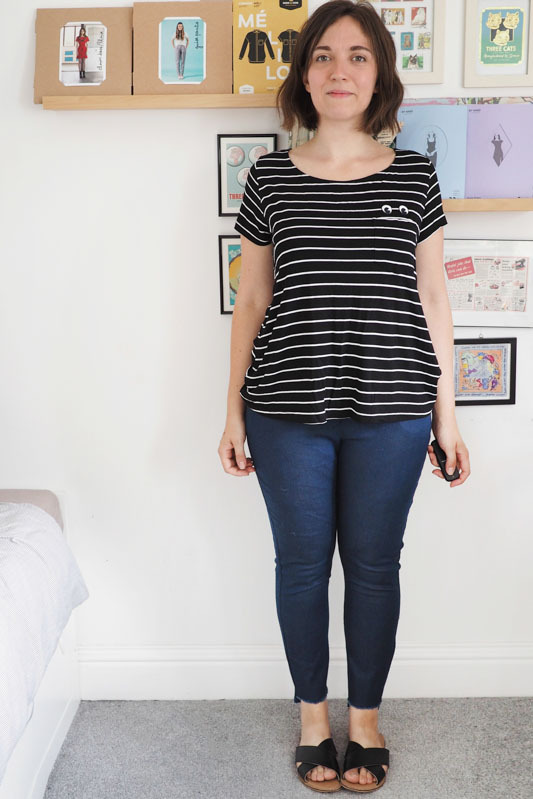 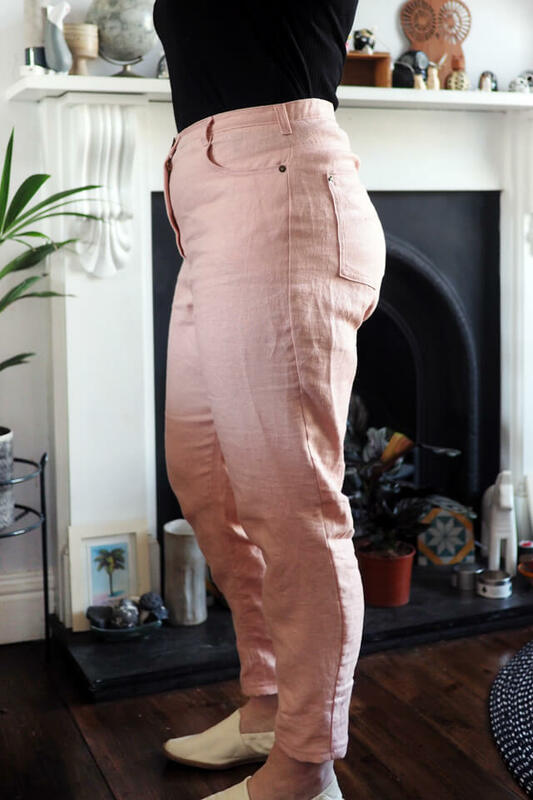 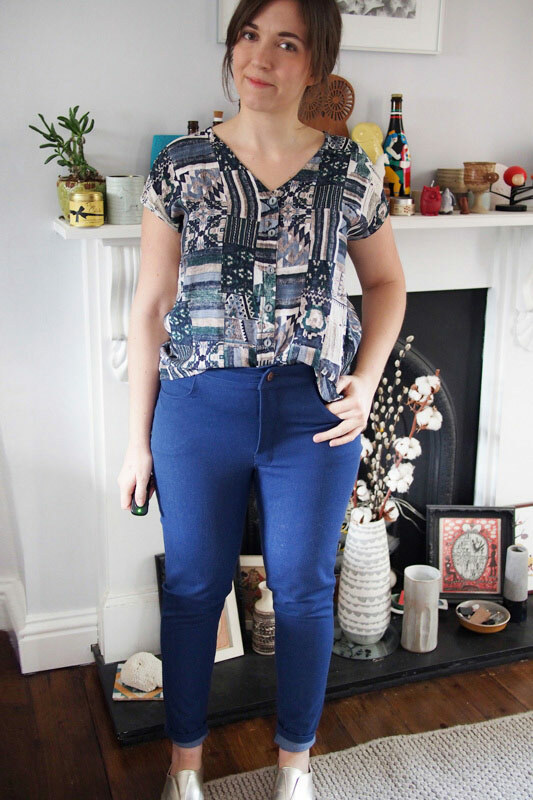 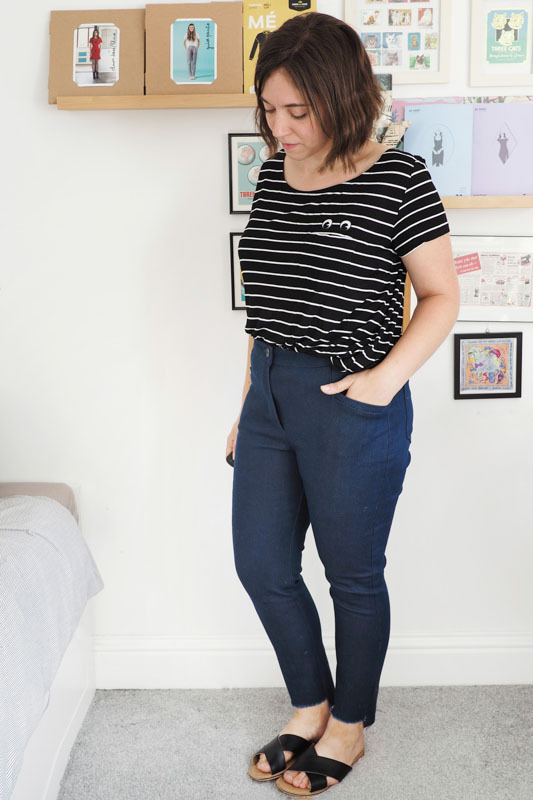 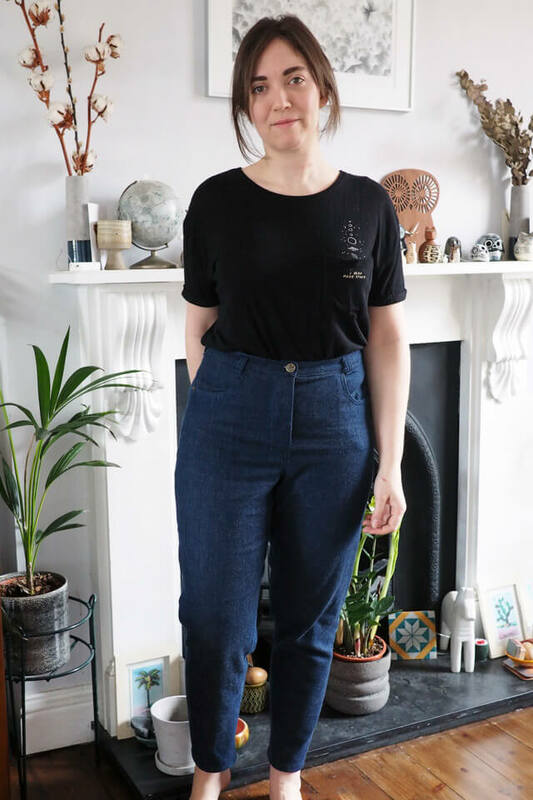 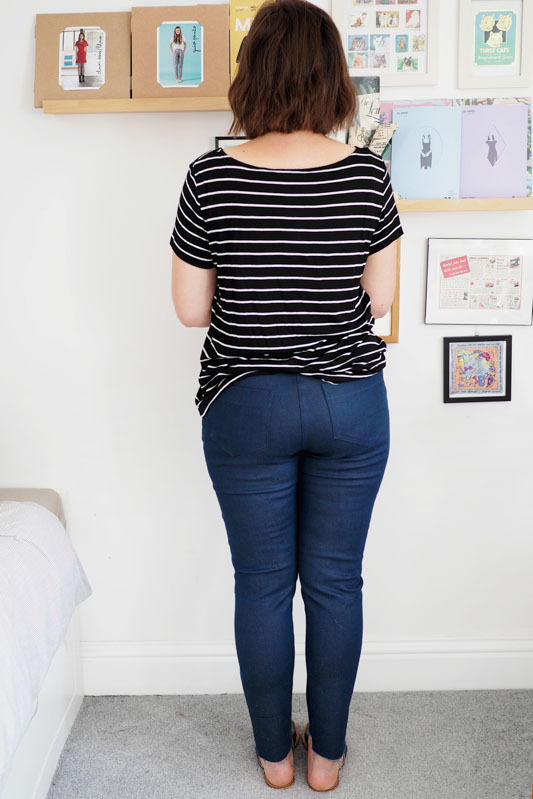 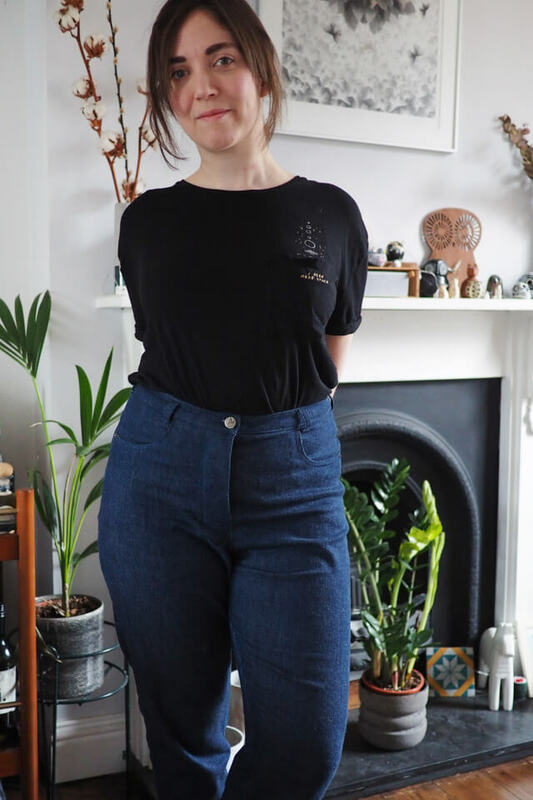 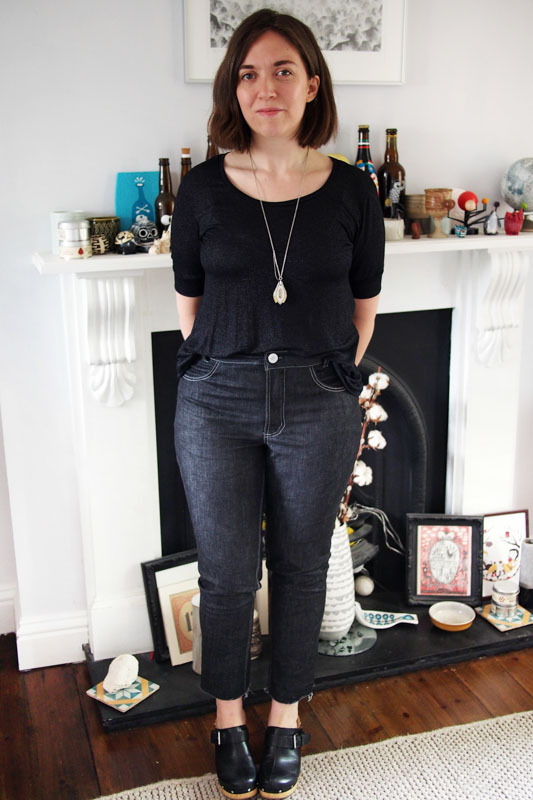 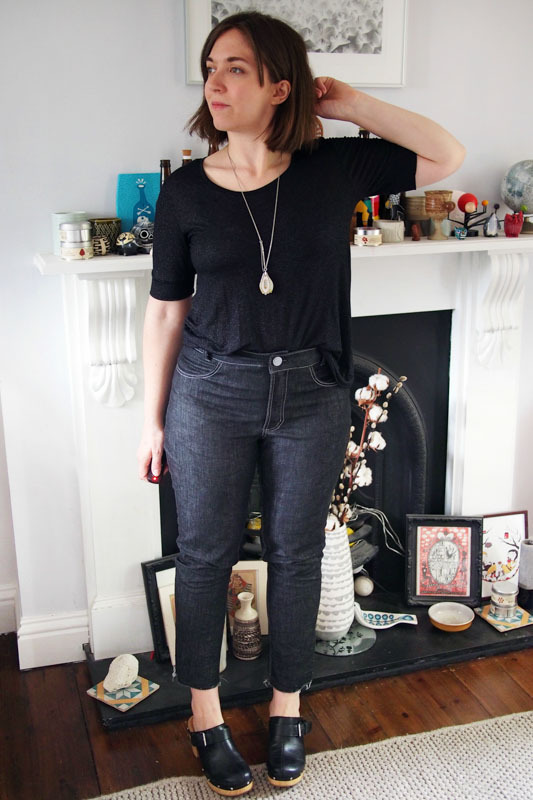 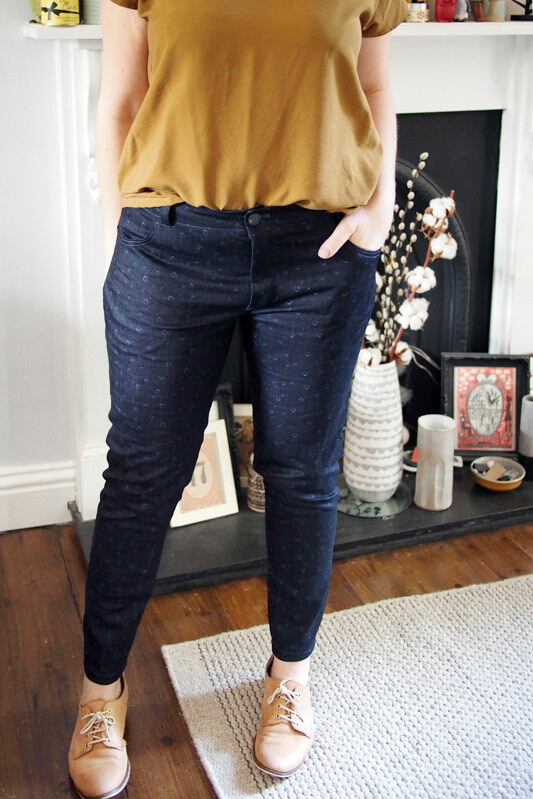 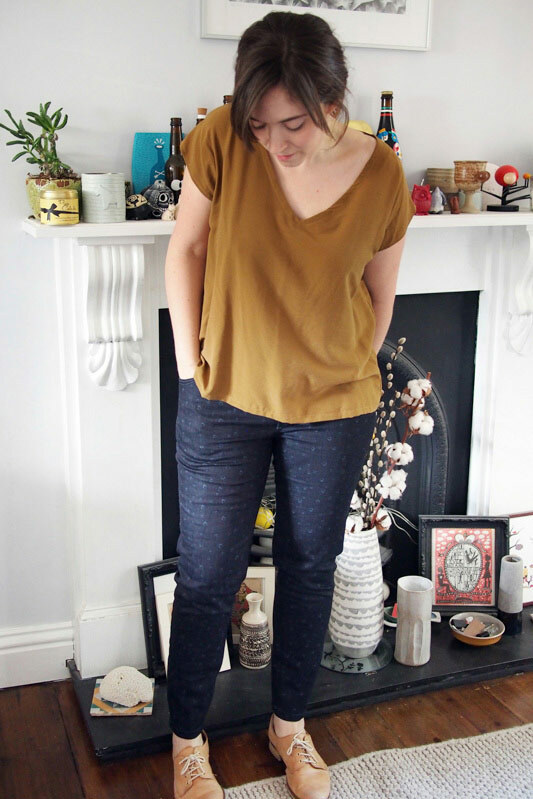 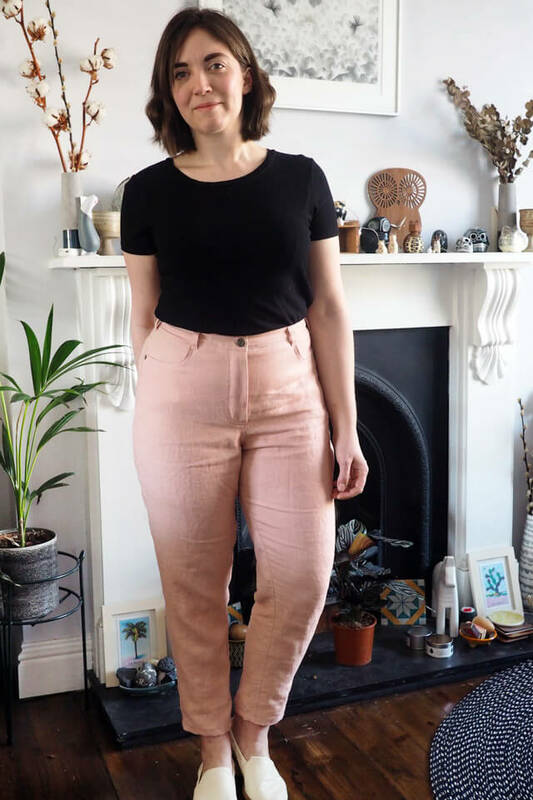 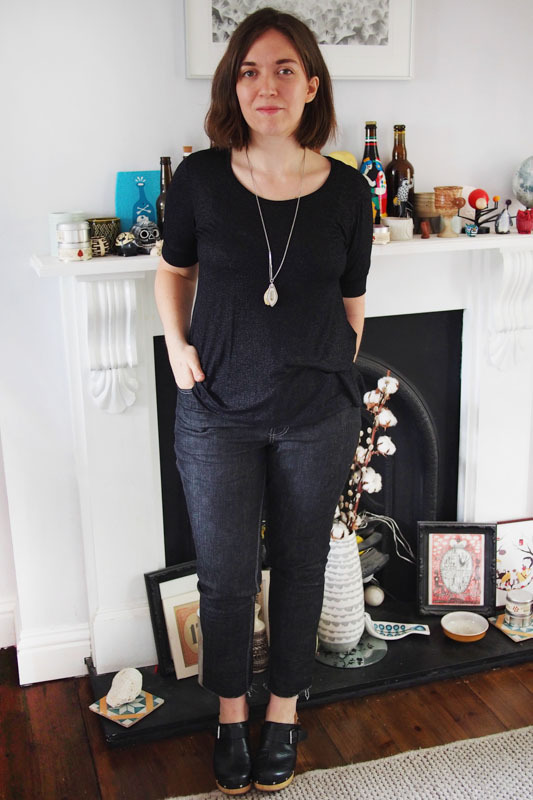 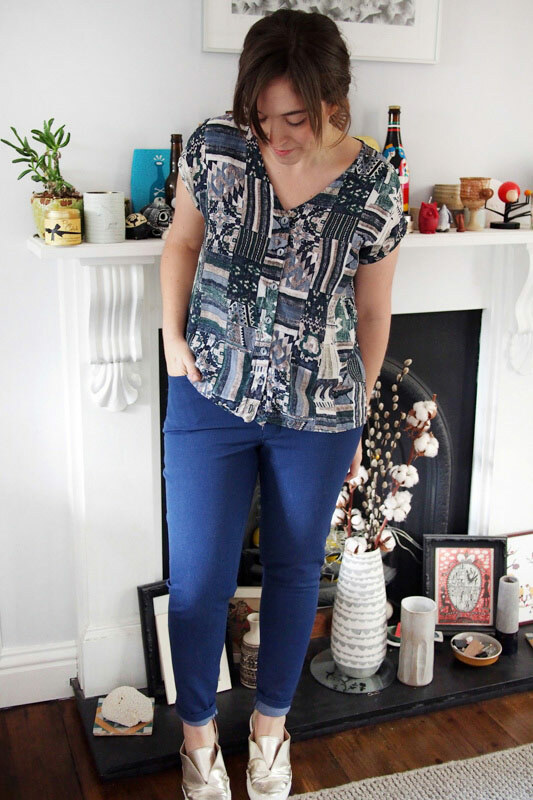 I dug out the Ginger jeans pattern again because I’ve had some lush denim kicking around my stash for ages and really fancied trying a few tweaks out based on some RTW window-shopping inspiration. 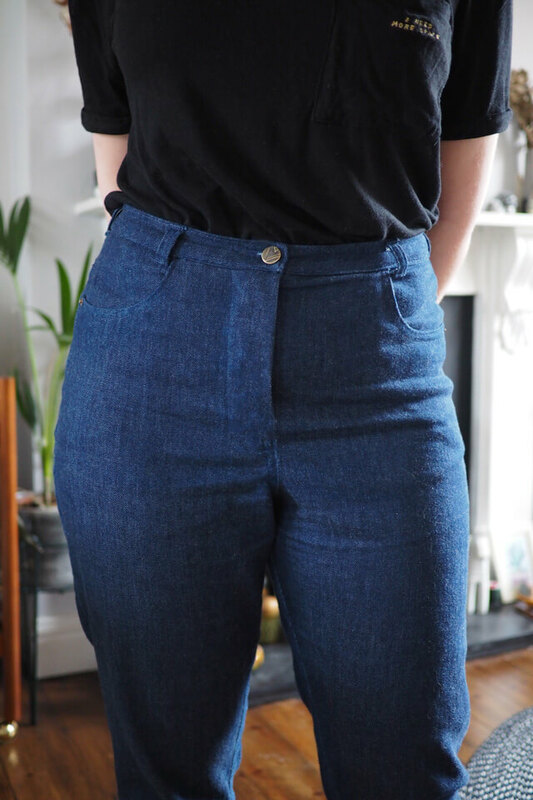 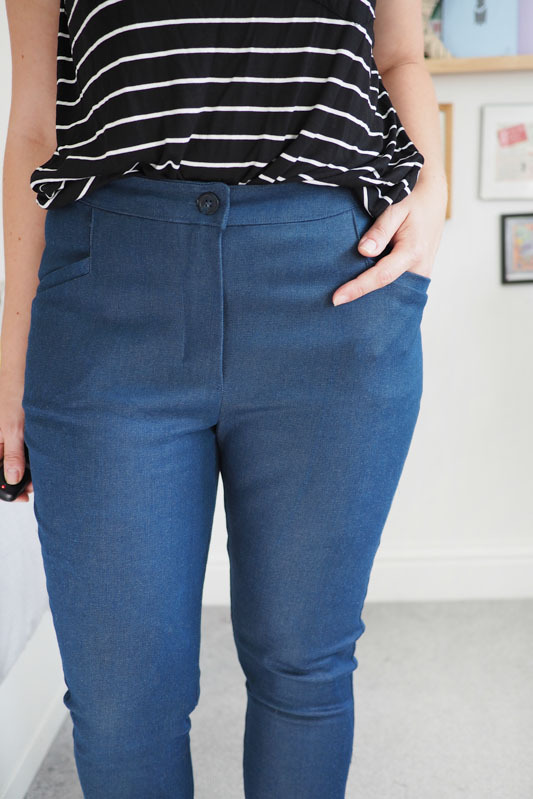 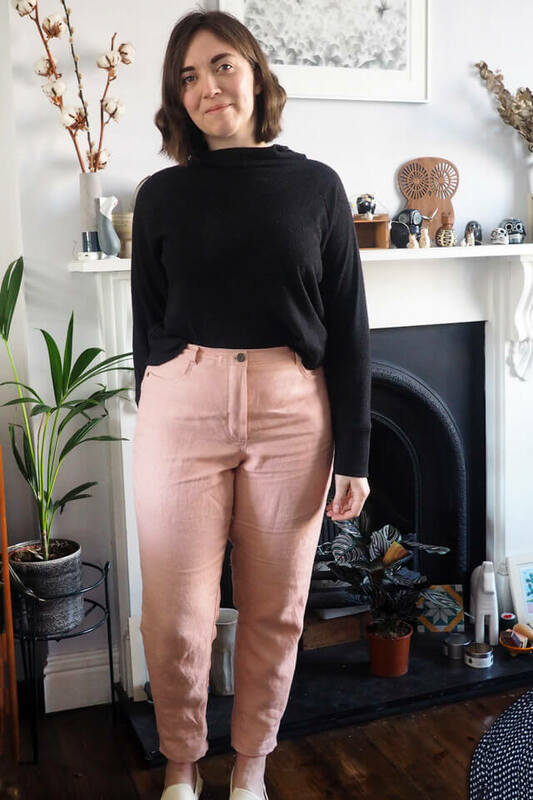 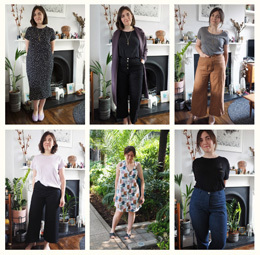 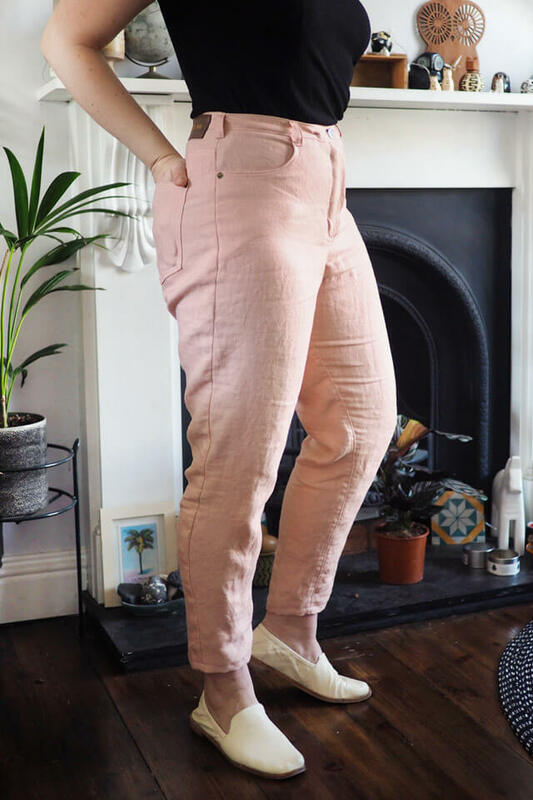 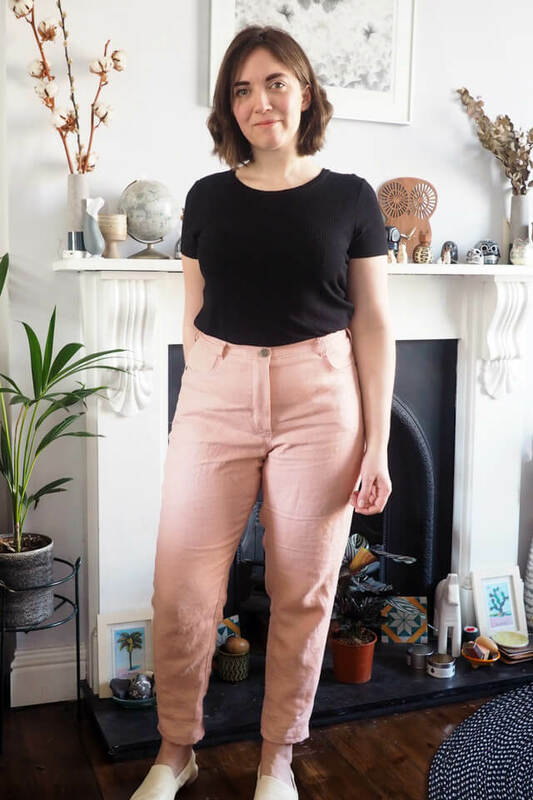 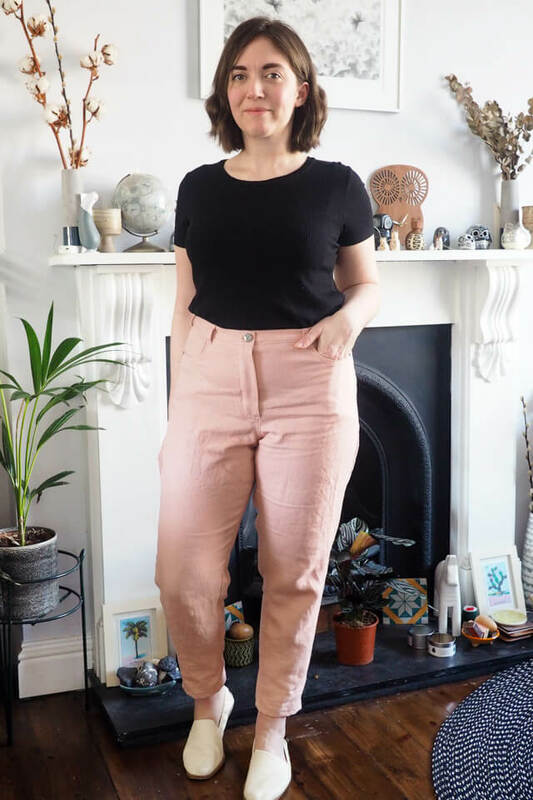 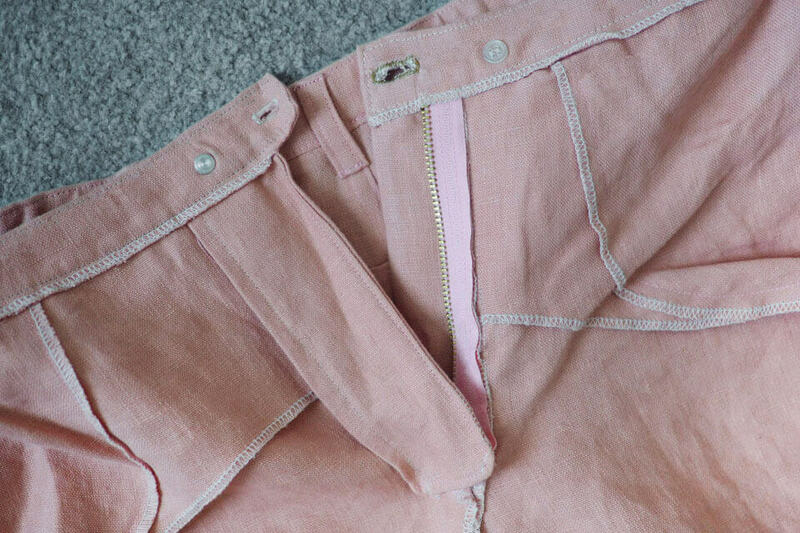 With the high waist and cropped frayed hems it’s about as close to the ‘mom jean’ trend as I’ll allow myself to go – and another tick off my to-sew list board. 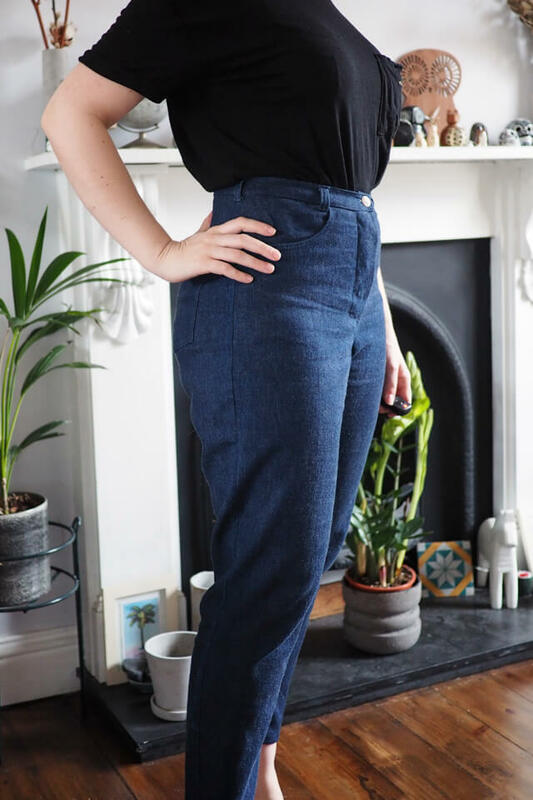 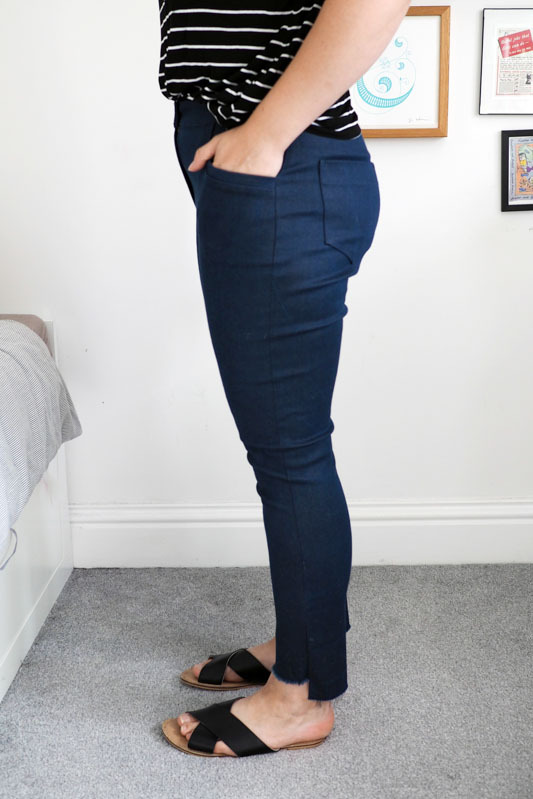 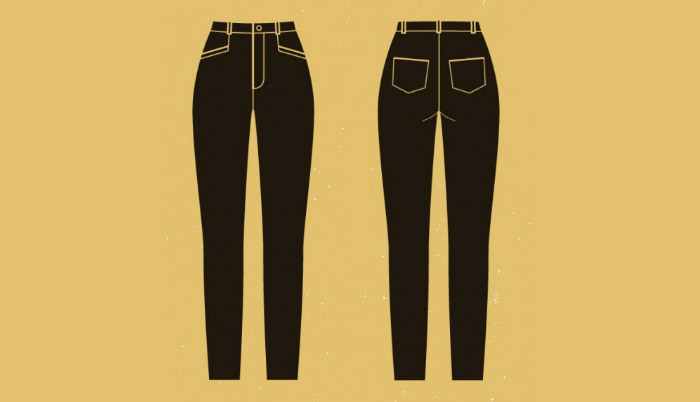 These are view B of Ginger, the high waisted skinny leg ones, the only difference being about 4″ chopped off the length and about 3/8″ more ease at each side seam for a non-skintight look. 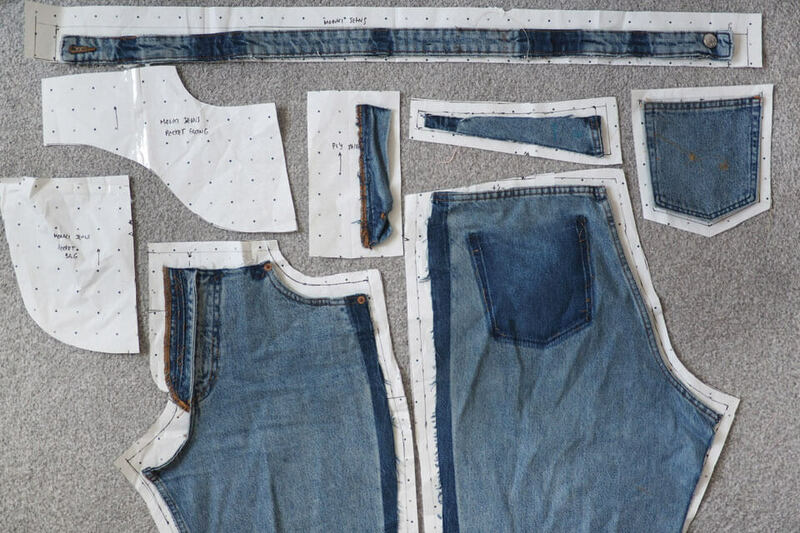 I cut the legs with the pattern pieces butted up to the cut edge of the denim: after being through the prewash it had a good amount of artful natural fray. 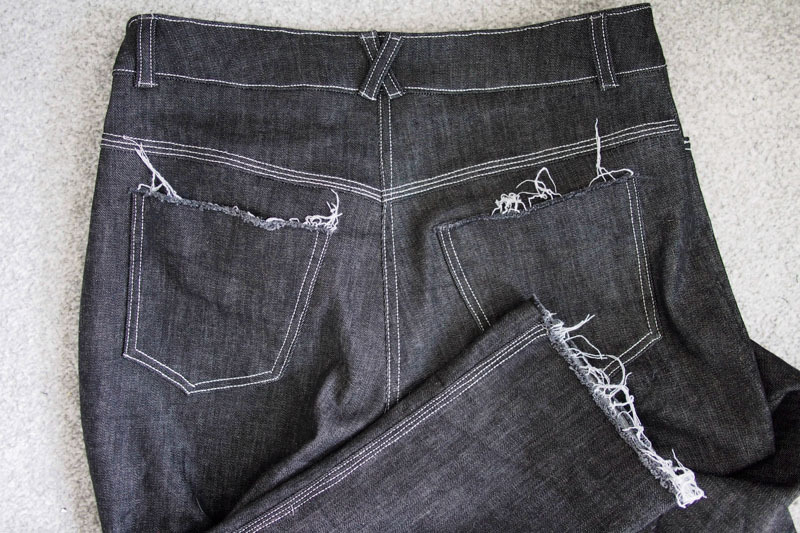 I cut the top of the back pockets on a raw edge too. 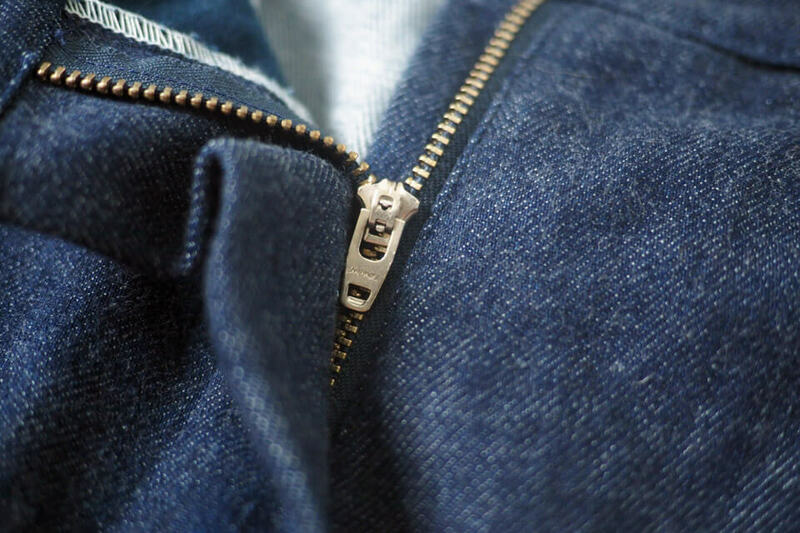 For a change I did three lines of topstitching along the yoke and inseam using regular thread in pale grey and my machine’s triple stitch function to make it stand out nicely. 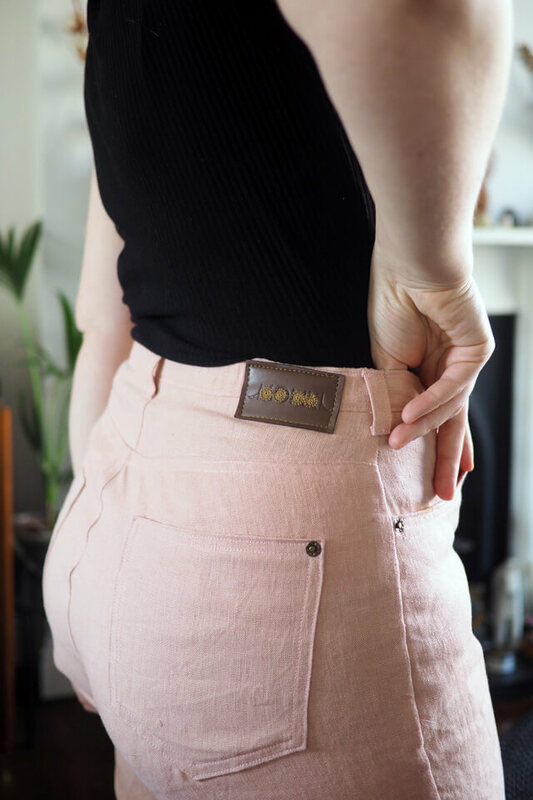 I like how it looks on the seams but it didn’t work so well for the fly topstitching: the back-and-forth action made it go a bit wobbly around the curve. 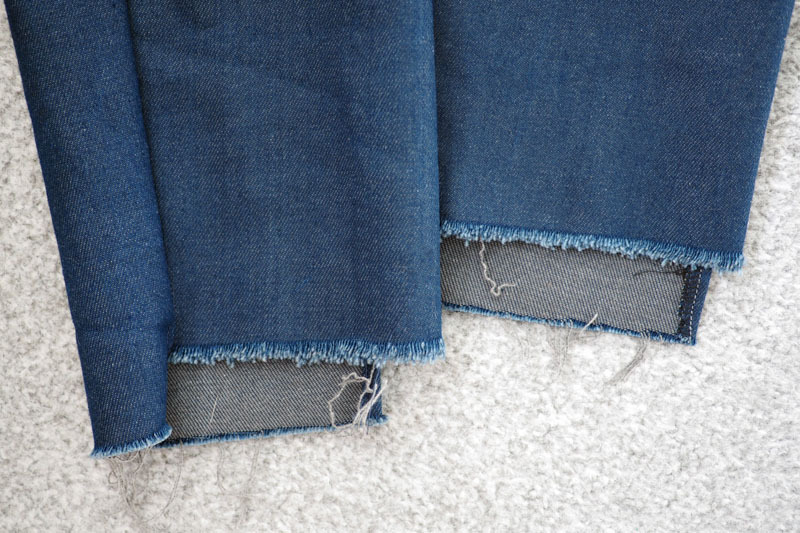 I ripped out my first go (it’s not a fun stitch to rip) and it’s still not looking super great. 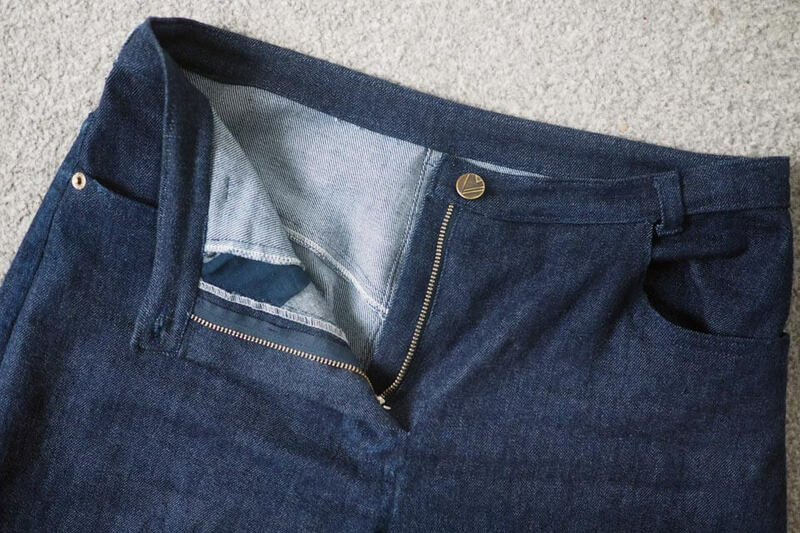 Funny how those things get less important once you actually start wearing your new pants though, eh? 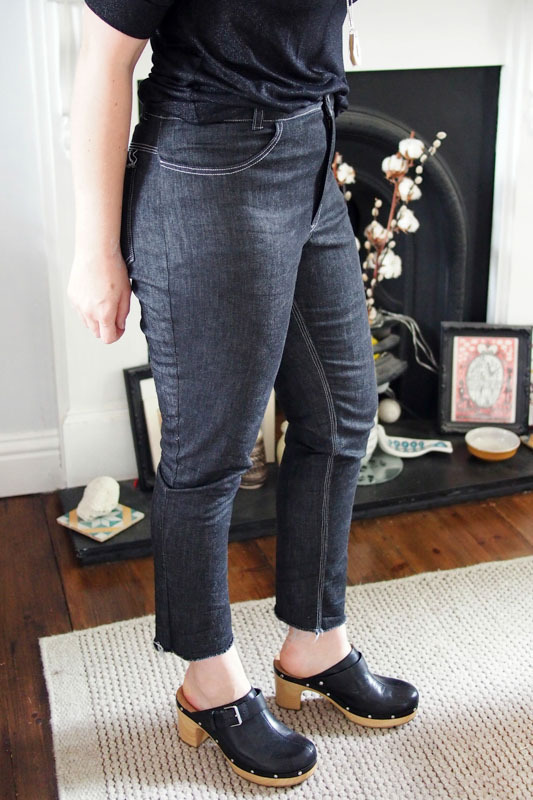 The denim is the famous Cone Mills stuff, which Katie of Handmade Threads / Threadbare Fabrics kindly gave to me when I met up with her in LA last October. 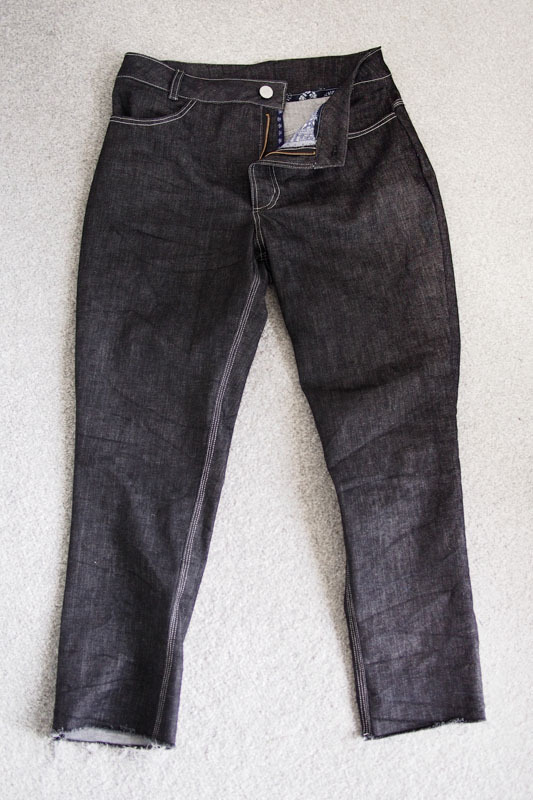 I’m not sure which weight and colourway it is, but it’s quite lightweight with plenty of stretch in a dark charcoaly-indigo shade. 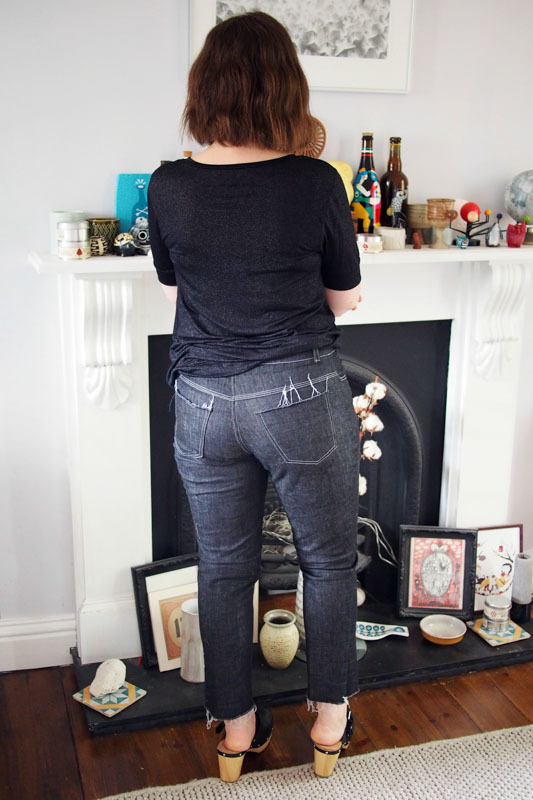 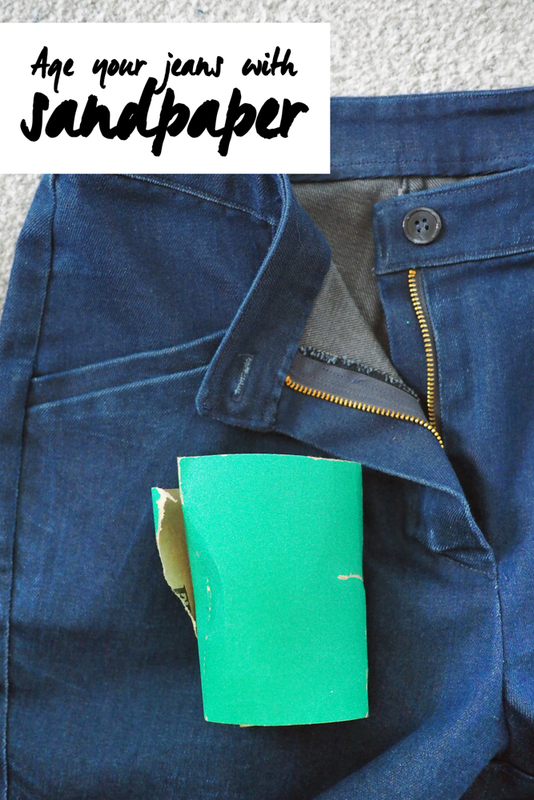 It’s *insanely* comfortable: when I tried the jeans on partway through construction I didn’t even want to take them back off. 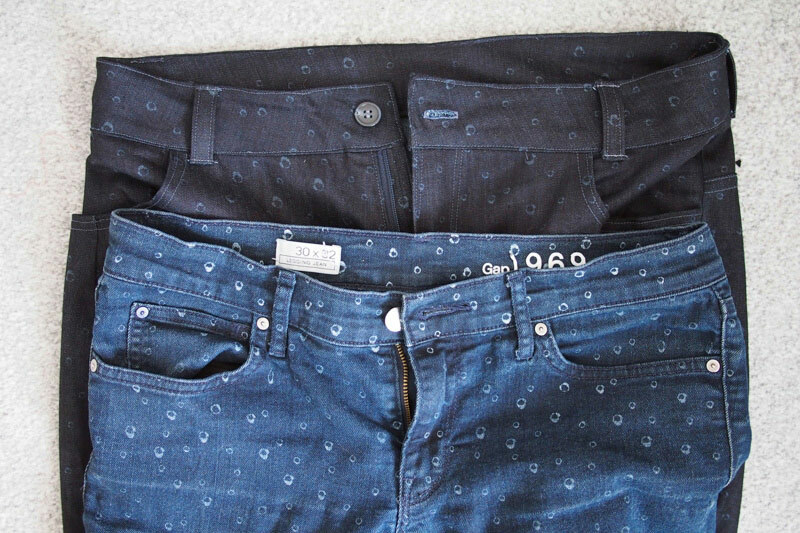 I really hope they keep their shape as promised! 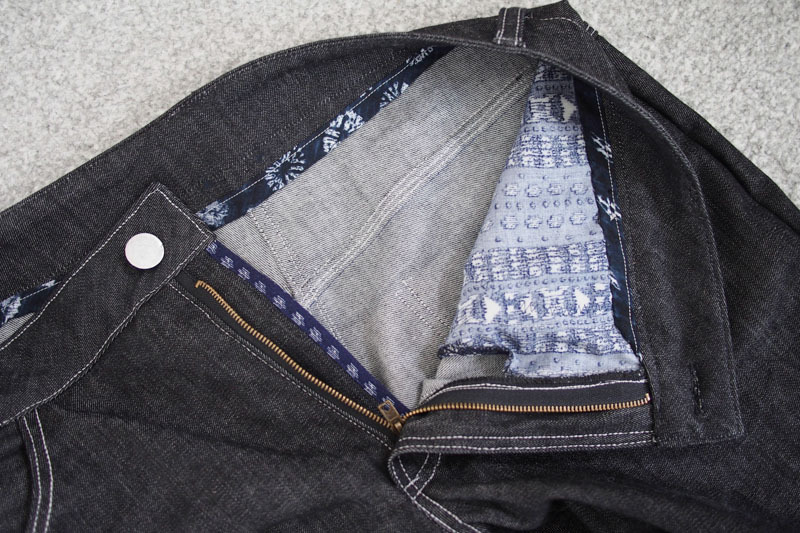 Pretty guts using scraps of ikat-printed rayon for the pockets and to bind the inner waistband and fly shield.